This is a great treat to have Maggie Meister returning to Anchorage! As explained in the project descriptions below, Maggie's beautiful seed bead work is inspired by history--whether it be that of the Roman Empire or the Art Deco period. Maggie also leads Beadventures' trips to Italy, where she lived for five years in Naples. Project samples will be on display at Alaska Bead Company in mid-May. What Maggie writes about this project . . .
“During one of my visits to Stitch n’ Craft Beads in Dorset, England, I was shown a book from a Museum of London exhibition about the “Cheapside Hoard” that immediately inspired me! The “Cheapside Hoard is a collection of jewelry from the late-16th and early-17th centuries that was discovered in 1912 by workmen excavating in a cellar at 30-32 Cheapside in London. They found a buried wooden box with more than 400 pieces of Elizabethan and Jacobean jewelry, including chains, with colored gemstones and enameled gold settings. The entire hoard was displayed together for the first time in more than 100 years at the Museum of London from October 2013 to April 2014. Techniques used: Variation of Huichol Stitch, Peyote, and Cubic Right Angle Weave (CRAW). “Art Deco was the era of flappers, fashion, music, and politics, and at the same time it was when the stock market crashed in 1929 followed by many years of The Great Depression. I have always loved the geometric lines and angles of that era’s designs, which was very different from the fluid lines of the previous Art Nouveau period (I adore this period also). The Art Deco Era became a recognized movement with the Exposition International des Arts Decoratifs et Industriels Modernes that was held in Paris in 1925, which was largely dedicated to the jewelry arts. Techniques used: Cubic Right Angle Weave (CRAW), Flat and Circular Peyote Stitch, embellishing 8mm Swarovski Chatons, and capturing 3mm cup chain. "I love the Art Deco period of both adornment and architecture! 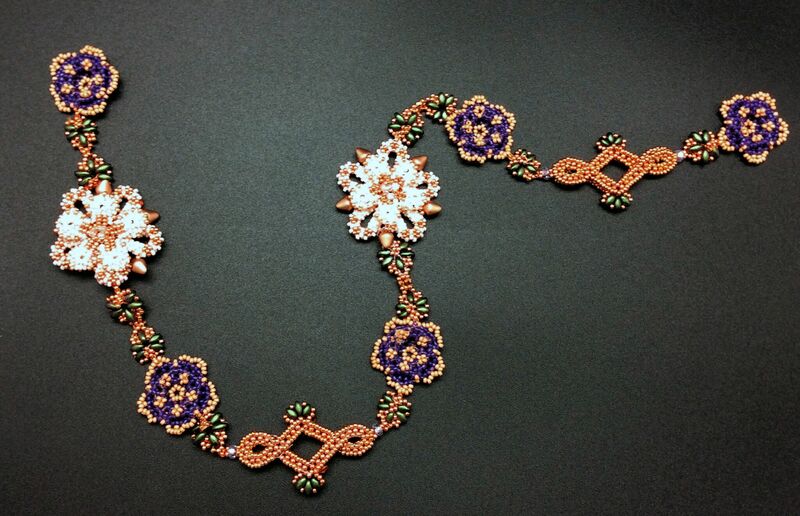 The severe lines and geometric shapes are fun to recreate with beads. The necklace was inspired by an architectural feature found in many Art Deco buildings." Students will learn to capture a coin-shaped bead in a circular peyote bezel. Each component is made by building off of the focal coin with Brick Stitch using 3 colors. The chain is made with Double St. Petersburg stitch using tiny square beads. Techniques Used: Peyote and Brick Stitch. About Maggie Meister . . .
"The love of ancient history, color and patterns have followed me throughout my life and my designs have come to fruition during the time my family and I lived in Italy. In looking back, beads have always been a part of my life – from playing with Mardi Gras beads, to collecting semi-precious stones as a young girl, to my love of ancient and ethnic jewelry as I became older. Today seed beads have become the medium I use to translate my sources of inspiration into personal designs for adornment. 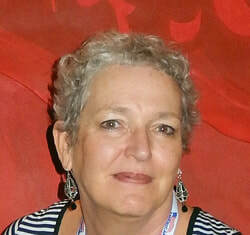 In addition to teaching around the United States and Europe, Maggie leads Beadventures to Italy each year. Her book, "Classical Elegance," was released in August 2011. 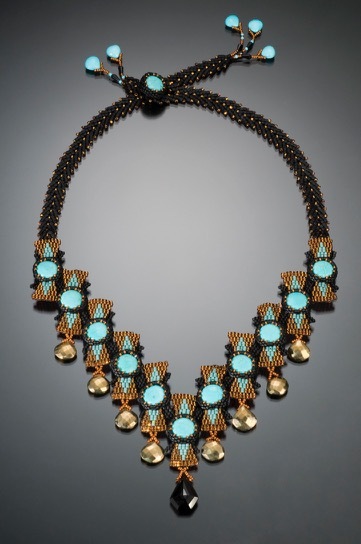 Her work was featured in the October 2012 issue of Ornament magazine and Maggie was a 2013 “Designer of the Year” for Beadwork Magazine. Learn more about Maggie and her work at her gallery.